Are you looking to add some extra security measures to your blogger site? Are you worried about your blogger blog getting attacked from malware? With Blogger's Free SSL certificate service, now you can protect your blogger site and your visitors by adding an extra layer of security. Moving from HTTP to HTTPS and installing an SSL certificate to your blogger site is fairly simple. In this article, we will show you how to enable free HTTPS SSL certificate in Blogger. SSL stands for secure socket Layer which increases the security between a website and a user. We daily fill online forms, shop products online, and numerous other things we do to send our information to the web servers. In order to protect the data transfer we need a secure connection. That's where SSL Certificate provides that matters. HTTPS connection, establishes an encrypted connection between a user and a web server, so hackers do not get access to the information of a particulate user. Every site has a unique SSL Certificate this helps in identifying secure connection. 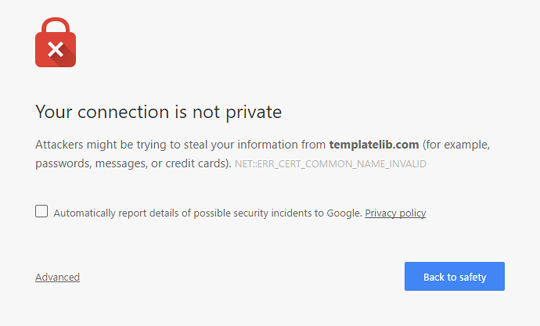 Any site that is pretending to have a secure SSL, HTTPS connection and its certificate does not match, and then your browsers will give you the following warning message. Why you should use SSL? When it comes to search engine ranking, Google gives more importance to HTTPS sites than HTTP sites. Having a secure connection gives a stronger message to the search engine that you give importance to your site security. This is the reason why sites which have a secure connection might run a little better than the other sites which doesn’t have a secure SSL connection. Roughly, a basic SSL certificate costs about $10/year for each site. Luckily, blogger offers a free SSL solution to its blogger users. Unfortunately, blogs with custom domains does not support this feature only free domains can have free SSL certificates. To Enable HTTPS, sign in to Blogger and select a blog on which you would like to enable HTTPS. Go to Settings >> Basics >> HTTPS Settings. Now your blog has a unique SSL certificate which will provide an extra layer of security to your site. Now go and open your site with https:// and enjoy free SSL support from blogger. You can add SSL support to all your blogger blogs for FREE. We hope this tutorial may have helped you in learning how to add a Free HTTPS SSL certificate in blogger. Sadly, this feature is only for free. BlogSpot domain and not custom domains. However, we will surely bring away soon that will allow custom domain users to have free SSL certificates as well. If you like this article, share it with your friends and comment.